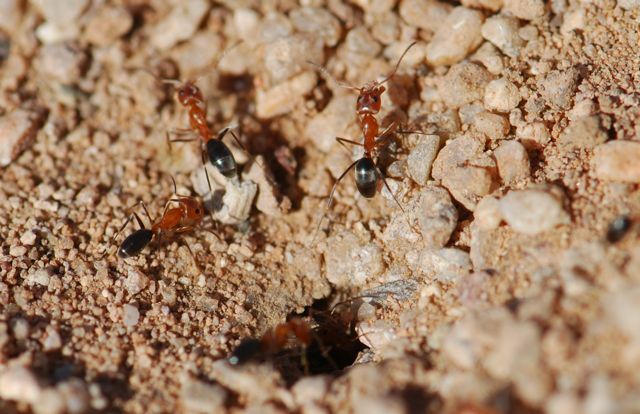 Dorymyrmex bicolor ants are common in Arizona, especially in open areas. In a previous post, I wrote about how to identify them. A few weeks ago I visited an agricultural research station and found almost a monoculture of Dorymyrmex. Each reflect the color of the soil beneath the surface. This one wasn’t a perfect circle. Tofilski and Ratnieks (2005) studied the mound formation of two colonies of Brazilian Dorymyrmex. 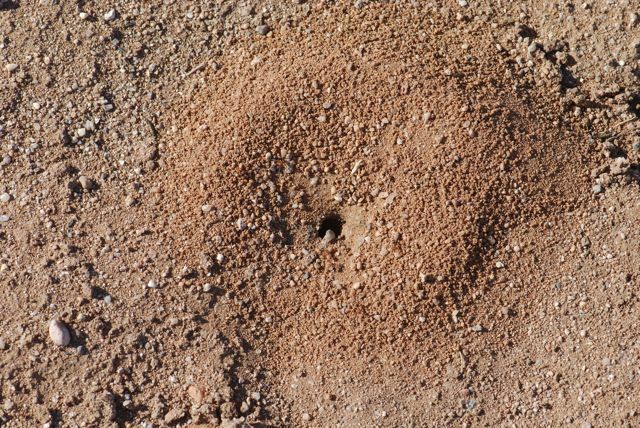 They found the worker ants removing excavated material from the nest deposited their loads at the crest of the mound and beyond, preventing the material from rolling back into the entrance hole. They also indicated that workers maintained the circular shape, when one side was removed, by climbing the area with the least slope to deposit their loads. 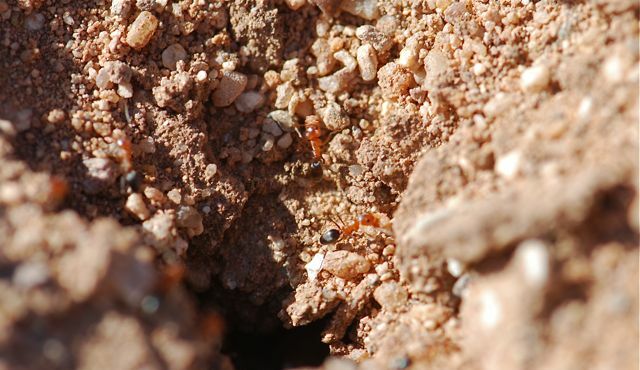 Ratnieks noted that ants of other, larger species had difficulty climbing the mounds, thus suggesting the mounds served a protective function. As you will see in the next few photographs, the Dorymyrmex were carrying out clumps of soil and related materials the morning I visited. Because ants at all the mounds were so busy removing material, I began to wonder about it. Were the clods of soil and pebbles rolling into the entrance hole over night? Perhaps there had been a wind storm or vehicle disturbance? 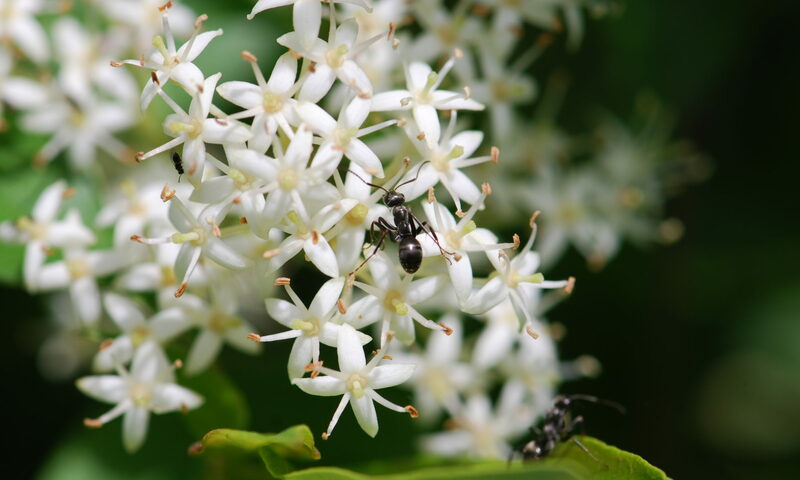 By the way, you might recognize these ants under a different name. Prior to a revision of the genera, Dorymyrmex bicolor was known as Conomyrma bicolor. Under that name, they had a brief burst of limelight when Möglich and Alpert (1979) found they exhibited tool use by dropping small stones on their competitors, particularly Myrmecocystus workers. Finding ants that stoned their enemies caused quite a stir, as you can imagine. 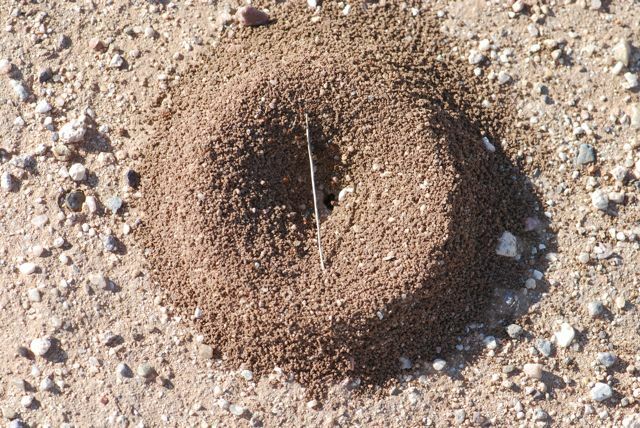 Thinking about that, I also began to wonder if perhaps Dorymyrmex bicolor worker ants also drop stones on conspecifics, that is other Dorymyrmex bicolor nests. With the name change, it is somewhat hard to track the literature. Does anyone know? Anyone studying Dorymyrmex bicolor? If not, perhaps it would be worthwhile to visit these fascinating ants some evening. Adam Tofilski and Francis L. W. Ratnieks. (2005). 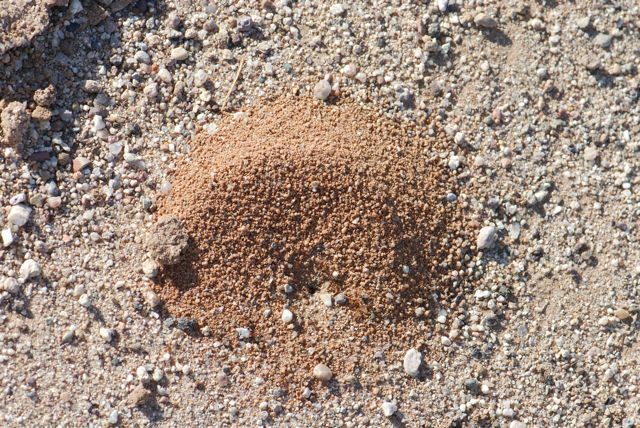 Sand Pile Formation in Dorymyrmex Ants. Journal of Insect Behavior, 18(4): 505-512. Michael H. J. Möglich and Gary D. Alpert (1979). Stone Dropping by Conomyrma bicolor (Hymenoptera: Formicidae): A New Technique of Interference Competition. Behavioral Ecology and Sociobiology, 6 (2): 105-113.